A Standard IV student from Itadara Primary 2 School, Itadara, Gujarat, Hinaben has become an inspiration for children as she aspires to become a police officer. All thanks to the changing times that even a girl child can dream of a courage-filled profession thereby breaking the conservative mindset of people. Belonging to an OBC category, she comes from a family of 6 members. Her father is a farmer earning an average monthly income of Rs. 4,000, and her mother is a homemaker. She has two siblings namely Rudra and Ashwin aged 14 and 7 years respectively. Talking to us, Hinaben mentions that she loves playing 'Kho-Kho', a game of speed and stamina. And, maybe the skills of the game and the all-round fitness will cushion her dream of becoming a police officer. 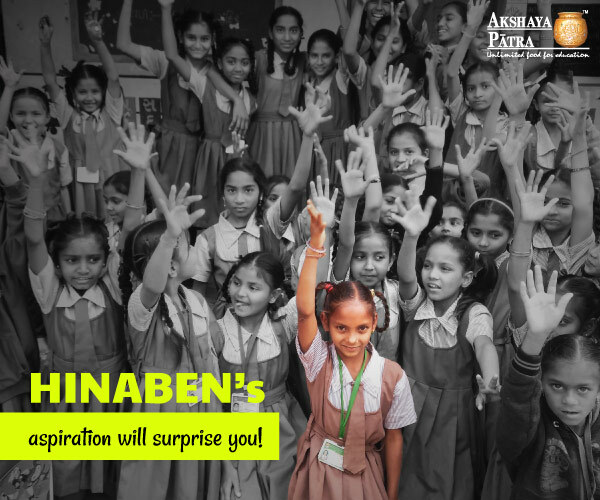 This lively young girl sounds quite confident when asked about The Akshaya Patra Foundation. With a big smile, she says, "I like the food - it is hot and tasty as well. My favourite is rice and dal." Wouldn’t you like to extend your good wishes for this little girl with a big aspiration?